The history of this 11 thousand strong town is related to the ancient stronghold of Słońsk upon Vistula, where the town is presently situated. When Poland lost the salt mines in Bochnia and Wieliczka to the Austrians, the focus was on the brain springs in the area of Słońsk. In 1791 the Polish Parliament ordered to start the salt production in Ciechocinek and the nearby Raciążek. In the years 1798-1801, the Prussian authorities took over and started to exploit the springs of brait. 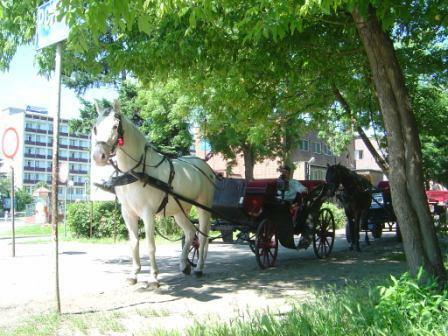 In 1823 Ciechocinek started to develop as a health resort. The first two graduation towers were built in the years 1824-1833, yet it was only in 1916 that Ciechocinek gained municipal rights. We leave the Railway Station, built in 1902, and see the Kopernika Street. On the opposite side of the street there is the Summer Theatre from 1890, a marvellous example of the late 19th century spa architecture. We go into down the Kopernika Street, which leads us to the Kościuszki Street. There we turn left and reach the Gdańsk Square. Crossing it, we enter Tężniowa Street. On the right we can see the Tężnie Park from the 1908, with a bust of Stanisław Haupt from the 1961. The most famous attraction of the park is the flower clock, designed by Zygmunt Hellwig in 1934. The mechanism of the clock is hidden underground and the face of the clock is a composition of thousands of colourful plants, different every year. We reach the first graduation tower. The complex of the three graduation towers was designed by Jakub Graff and built in the years 1824-1859. 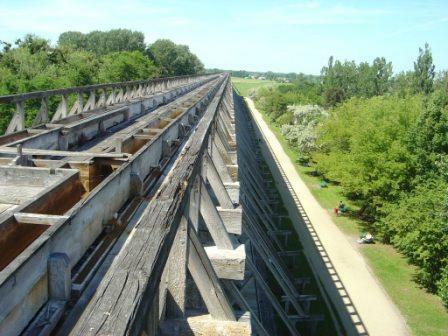 Its joint length is 1742 meters. The towers serve not only the purpose of salt production. They also have a curative influence, due to high concentrations of iodine and ozone around them. A graduation tower is a 16 meter wooden construction, divided into segments that are filled with blackthorn twigs. 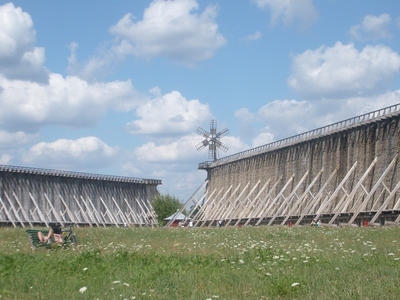 The salt is produced as follows: low-salt brait (6%) is supplied from the source to the highest level of the tower. Then it flows down the blackthorn twigs. Thus, the brait circulates up and down the tower, reaching the concentration of 25%. To concentrate in Polish is stężać, hence the Polish name for the tower: tężnia. The concentrated brait is then directed to a salt evaporation plant, where it is thermally processed to obtain crystals of salt. The tower we can see in front of us lies on the border between the Tężniowy Park and the Zdrowia Park that dates back to the 1932. There used to be a famous brait swimming pool, opened in 1932 by the Polish President. In the middle of the tower we will find a passage and get on the other side of the tower. Here we can enter the tower and go up to its top. We go back to the Gdańsk Square and continue down the Kopernika Street. 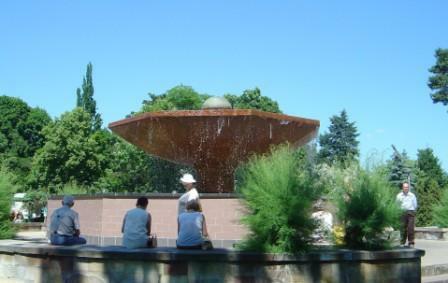 When we get to the Zdrojowa Street, we will see the famous spring fountain, Grzybek (Mushroom). It is a water intake from 1911. The well is 409 meter deep, and the brait is directed from it to the complex of the graduation towers. The spring is decorated with a mushroom-shaped fountain. The curative value of Grzybek, with brait flowing down and gathering in a pool, is well known by tourists and spa clients. Farther on, to the left, we can see a monument in the form of a column with eagles on the top. This monument is dedicated to a heroic Polish insurgent, Romuald Traugutt. It was erected in 1933, on the 70th anniversary of the uprising he took part in. We turn left into the Traugutta Street and, after a while, left again. 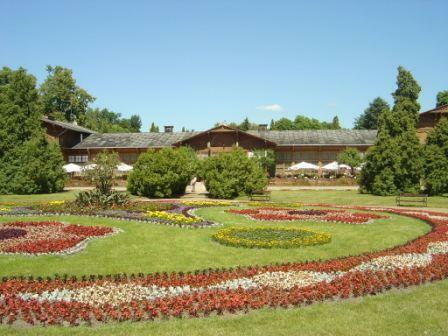 We enter the Park Zdrojowy (Spa Park), founded in 1875. The building in front of us is a pavilion from 1880. Extended, it presently hosts a pomp-room, cafe Bristol and a concert hall. We go around the pavilion and enter the park’s main alley. 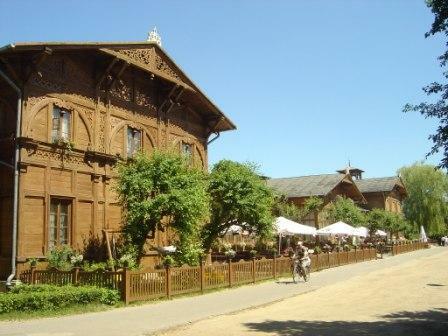 On the right, there is a band shell, designed by Waldemar Fedders in the Zakopane style, and constructed in 1909. Going down the alley we reach the famous fountain of Hansel and Gretel (Jaś i Małgosia). In the centre of the fountain there are colourful figures of the boy and the girl, holding an umbrella, from which the water springs. Here we end our walk.